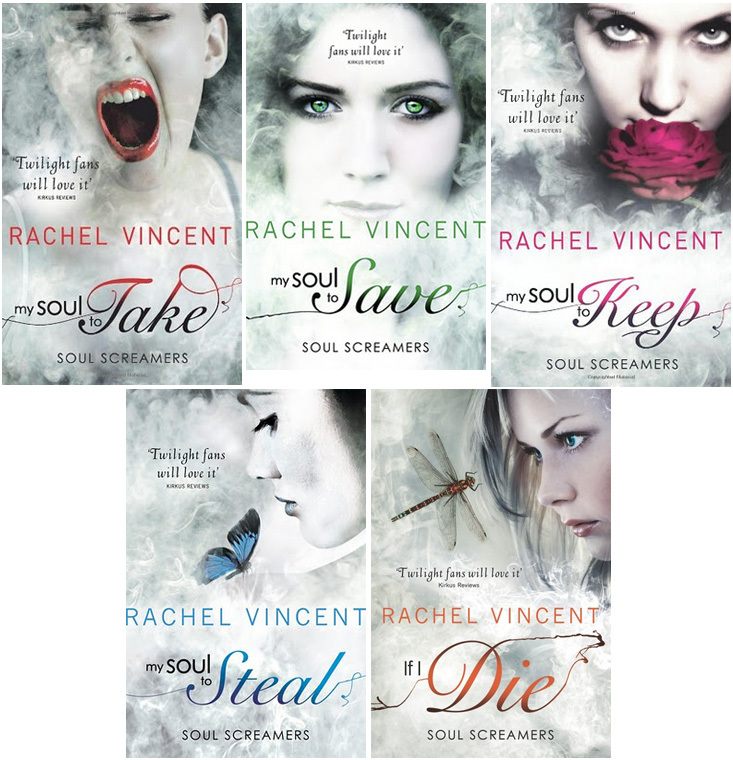 This is the third time I’ve had the pleasure of interviewing Rachel Vincent here on Dead Book Darling – a testament to a) her awesome blogosphere presence, and b) how much I friggin’ love her work. Readers should note that most of this Q&A deals with post-If I Die issues. That said, if you haven’t read the book you won’t be truly spoiled by reading this interview. But if you have read it, the answers will make a lot more sense! A. No. Tod (much like Sabine) kind of grabbed his part and squeezed everything he could from it. Like a child born for the spotlight. He’s irrepressible, and I love finding new things out about him as I go. Q. Nash seems to have changed a lot in the course of the series – are we seeing the “real” him now? Or is this “just the frost” that’s talking? A. At this point, I’m not sure that even Nash knows what the “real” Nash looks and feels like. I didn’t realize how complicated and tragic a path I was putting in front of Nash until I got to the end of My Soul To Keep and realized there was no turning back, without taking a copout ending (having Kaylee forgive and forget, which would have been unhealthy for her, and having Nash miraculously cured). And I don’t do copouts. So I had to admit that the only way out of this mess for Nash was the long way. The truth is that an addict is never cured. The cravings are always there, and the best you can really hope for is the strength to fight them. And to keep fighting. So there’s definitely hope for Nash, but that hope lies in continued strength, not in a miracle cure. Q. While I am in love with what you’ve done to Nash, Tod, and Kaylee, I wonder if I am alone in my feelings. Have you received much positive/negative fan reaction to If I Die? A. You know, it’s been interesting. And if anything, the reader reaction to If I Die has reiterated for me that there’s no way to please everyone with one book. Once people had read My Soul To Steal and realized that Tod had feelings for Kaylee, but that she didn’t know it, I started finding lots of reviews (many were actually comment threads) containing ultimatums. In fact, on Goodreads there was a pair of reviews only one or two apart that made me laugh out loud. Then want to cry. One said that if I put Tod and Kaylee together, she’d never read another one of my books again. Two reviews later, another reader wrote that If I didn’t put Tod and Kaylee together, she’d never read another one of my books. Overall, I have to say I’m thrilled that people are attached to the characters enough to care that much what happens to them. I consider that a success. But sometimes it’s really hard to remember that the world is big, and every reader is different. Some are going to love a book for the very same reason others hate it, and there’s nothing I can do about that. Which is good, because I can’t possibly craft a story to please its potential audience. All I can do is write the story the way I see it, staying true to the characters, even if that means making some of the readers mad. I can’t afford to wimp out (or copout) just because someone won’t like that ending. Someone will always dislike every ending. Q. With If I Die being such a game-changer of a book, I can only imagine that Before I Wake is going to be very different to the rest of the series. Am I right? And if so, how did that change how you went about writing the book? A. Yes. That’s inevitable. Without giving too much away, pretty much everyone’s changed at the end of If I Die, but the most difficult transitions are for Nash and Kaylee. Before I Wake is the sloth book (My Soul To Take was vanity, My Soul To Save was greed, My Soul To Keep was gluttony, My Soul To Steal was envy, and If I Die was lust.) which presented a unique challenge from the very beginning. How can you write a sloth-themed book and keep it fast-paced and exciting? In the end, the answer to that came from the characters’ natural personal progression. I’m illustrating sloth as depression, but the book is really about fighting depression—and fighting evil. Among other things. Both Kaylee and Nash are wrestling with things they’ve never felt before, and they’re both having trouble dealing. They both have a good support system, but they’re also kind of in the media spotlight at the moment, because the things that happened at the end of If I Die have drawn real-world attention, which is the last thing either of them needs. Q. Finally, can you give us a few teasers about what to expect from Before I Wake? As always, thank you Rachel for answering my questions. I absolutely cannot wait for Before I Wake! Check back in tomorrow for my review of If I Die (my favourite Soul Screamers book yet). These are just FANTASTIC questions!!! I have been a huge fan since the shift series and I NEVER think its up to the readers as to how the characters chose! That’s the whole point of reading, you go where the authors takes you, even if you don’t like it 🙂 on that note- I WILL ALWAYS READ MS VINCENT’S BOOKS- no matter what 🙂 thank you for this wonderful interview!! Awesome interview! Now I really really REALLY can’t wait to read Before I Wake. I am so totally in love with this series, I can’t wait for Before I Wake to come out!! !